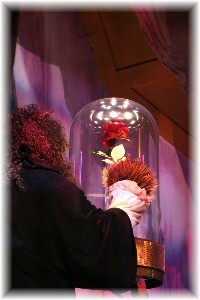 Clients and audiences love our Enchanted Rose with its dropping petals! Our rose is under a 15″ x 24″ acrylic dome (Total dimensions: 17″ x 29″). The rose flower drops its petals at the direction of an electronic controller run by a stage-hand. 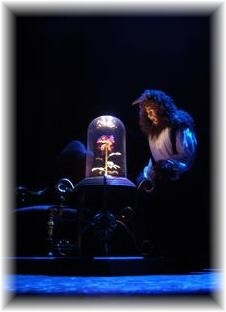 It will drop two petals at the appropriate places in Act I, then the rose “flower” is removed during intermission and replaced by just ONE PETAL which drops at the appropriate time towards the end of the show. Our rose is lit from below with halogen lights, and when also lit from above by a lighting special, the effect is stunning. Our Magical Mirror, used by Belle and Gaston, is a durable but lovely stage prop. The wooden and gold mirror has a multi-colored “chase” around the periphery, activated via a button. Very eye-catching!